DESCRIPTION: A 4-mile circular walk that takes you through the old Nannau Deer Park, past it’s north and south entrance lodges and the lodge and archway to the disused carriage driveway to Nannau (which is beside a minor road). 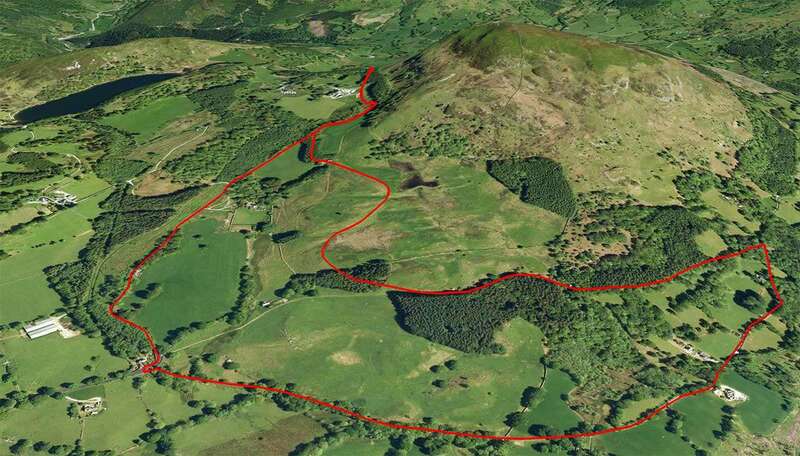 The walk has a total ascent of around 750 feet which is mainly on the second half. The first part of the walk and the return trip are along quiet country roads, so please be aware of the odd car (or you can, of course, walk back through the deer park and leave out the return walk along the road). Please allow 1 hour 40 minutes. START: The walk starts from the Coed y Groes (Precipice Walk) car park which is 2.3 miles up the main Dolgellau to Llanfachreth road. At the time of writing this, the car park is free and has toilets. 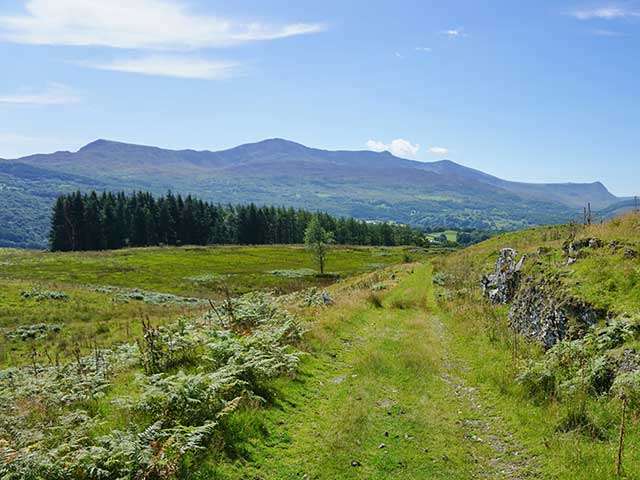 You can start the walk from the town by walking up the Llanfachreth road and joining the walk at Coed-y-Moch. That would make it a 7-mile walk to get back to town afterwards. BUS SERVICES: Occasional Busses run from Dolgellau to Llanfachreth and back to Dolgellau (past the car park). These run via Brithdir and are part of the No.33 Route (Machynlleth – Aberangell – Dolgellau). They only run on certain days and are infrequent on those. Please note that the walk through the deer park is a permissive path which is kindly allowed by the Nannau Estate. Care should be taken when passing through… while the deer have gone, there are sheep and lambs, so any dogs should be kept on leads. There are also two old fishponds so care should also be taken with young children. It is also VERY important to close all gates behind you, particularly at lambing time. Walk down the road you’ve just driven up, past the driveway to the Nannau Coach House and the Nannau Cottage sign on your right and continue past the Nannau Home Farm buildings and the old Granary with the “RW V AM 1834” sign which refers to Sir Robert Williames Vaughan (2nd baronet) and his wife Anna Maria Mostyn. These were made by laying old port bottles into the brickwork. There are a few Vaughan dedications marked into buildings in this area. Sir Robert was the MP for Merioneth for over forty-four years from 1792 to 1836. You will soon see glimpses of Nannau ‘Hall’ through the trees on your right. This is at least the fifth house of the Nanney & Vaughan family and was completed in 1796. Part of the tower of the previous house (built in 1693) forms part of a corner wall. Bricks from the 1581 house are also embedded in the back wall. The house has undergone many changes. It was used as an officer’s neurological hospital during World War One, the girls of Bedgebury Park School in Kent were evacuated here during World War Two. Since being sold by the family and splitting from the estate in 1975 it has been a private house, used as holiday lets and a hotel. However, the house has not been lived in for around twenty years. Continue down the road and bend right and after you leave the sloping fields on your left you will see the entrance to Hywel Sele Lodge on your left (on the right you will see an old driveway which led from Nannau across the road and straight into the deer park (the path which you are about to follow). Turn left into this very pretty tree-lined driveway and over the small stile beside a steel gate. 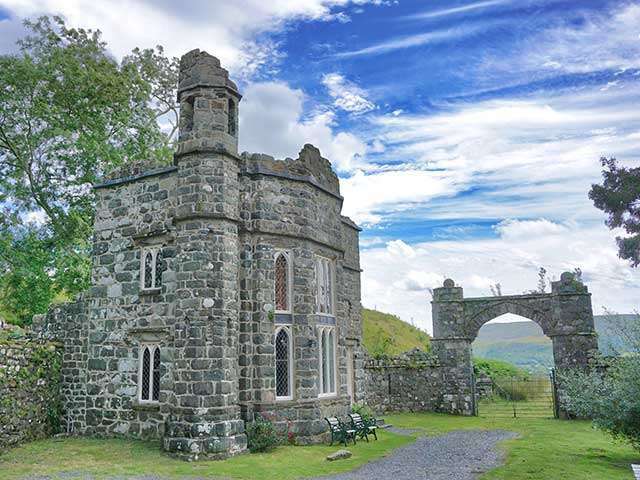 Carry on along this drive with its low stone wall on the left and soon you will see Hywel Sele Lodge and its Gothic Arch come into view. The lodge was built in the early nineteenth century and serves as the northern entrance to the old deer park, which is much earlier, probably dating back to medieval times. This building and arch are both Grade II listed and the lodge is now an extremely popular holiday let (see foot of page). 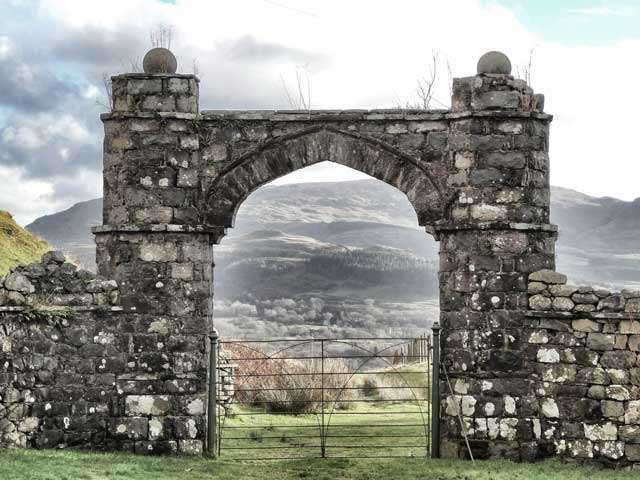 After you have admired this lovely building and are ready to continue, do NOT follow the sign and stile which go around the back of the lodge, but instead, walk through the first gate IN FRONT and through the second gate under the arch. Please remember to close BOTH gates afterwards. The park was home to the Nannau deer until heavy snow in 1963 drifted against the ten-feet high walls and the deer escaped. You can occasionally see glimpses of the hundred-strong herd in the local woods and Coed y Brenin, which was once part of the Nannau Estate. Hywel Sele Lodge stands on (or near) the site of at least one of the earlier Nannau houses, before at least two at the current location. In 1778, Thomas Pennant wrote that “in his time” the ruins of the old house could be seen in Nannau Park, “a mere compost of cinders and ashes”. You have now entered the old Nannau Deer Park. While its origins are thought to be medieval, it was landscaped in the early nineteenth century. Once you get past the Hywel Sele Lodge, you can see a small hill on your left where there are some old ‘pillow mounds’ which were used to keep rabbits, originally by the Monks of nearby Cymer Abbey. Continue along the footpath which soon passes the remains of two old fish-ponds on the left. These are now quite overgrown but were much larger and more prominent in years gone by. There is a small bridge that crosses them which was part of a network of paths that once crisscrossed the park. Behind these ponds is the hill “Foel Offrwm” (Hill of Sacrifice). As you continue through the gate after the fish-ponds (again, please close the gate afterwards), you can see the remains of one of the two stone pillars on the hills to your right. These ‘eye-catchers’ were thought to be used to signal the house that the guests were returning for dinner. You will soon leave the open area and pass through a small conifer wood. This wood was much larger as most of the conifers were felled around 2010 giving panoramic views. The Google map at the top of the page still shows the larger plantation, but only the stumps remain. 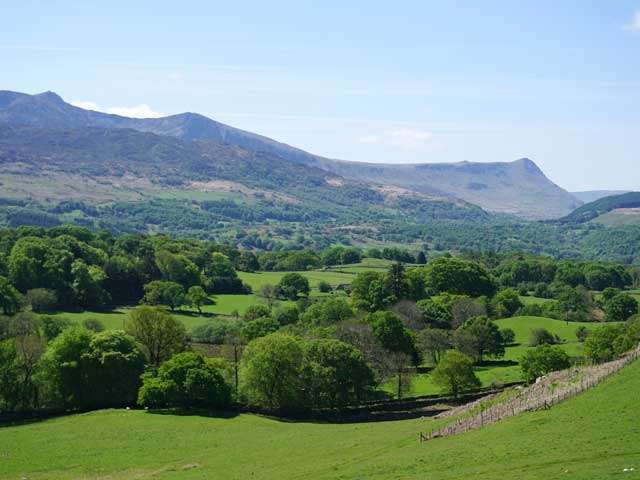 As you exit the small wood you get some of the best views of the walk, from the Arans in the East to the entire Cader Idris range and the hills to the West. This is where the trees were felled in 2012, before that there was no view at all. Continue along the well-marked track (with its small upright curbstones) and you will see “Lower Lodge” or “Deer Park Lodge” in the distance. 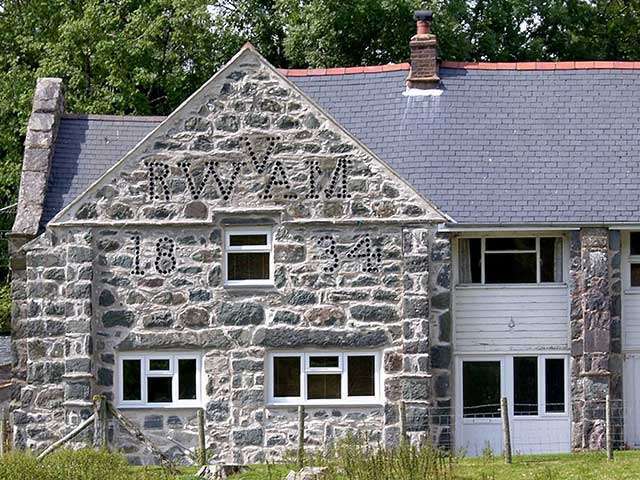 “Lower Lodge” is a one-up, one-down building, partly dressed in hung slate. It acted as the southern entrance to the park. It was split from the estate in 1975. 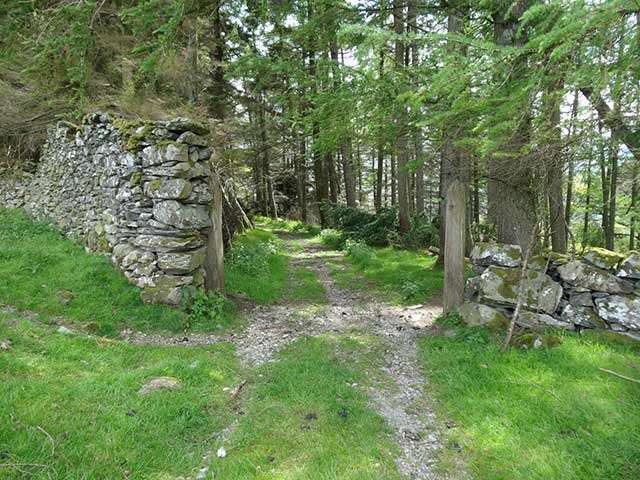 Continue along the track, over the stile and walk in front of the lodge, through the gate between the two large stone pillars (remembering to close the gate afterwards!). Continue along the third-of-a-mile driveway, passing through another gate (…and close) until it comes out on a quiet country road where you should turn RIGHT. You will see another footpath across the road which continues on to the other road to Llanfachreth and the pretty lake Llyn Pwll-y-Gele about a mile away, this makes another nice walk or an extension to this one. Follow the road past a nice old ruined house/barn on the right and past the house ‘Penesgynfa’ with its horseshoes by the door. Bend around to the right, ignoring the road turning on the left (This corner a nice place to see Redstarts in the summer). Follow the road past the old farm buildings of ‘Ty Mawr’ on your left. 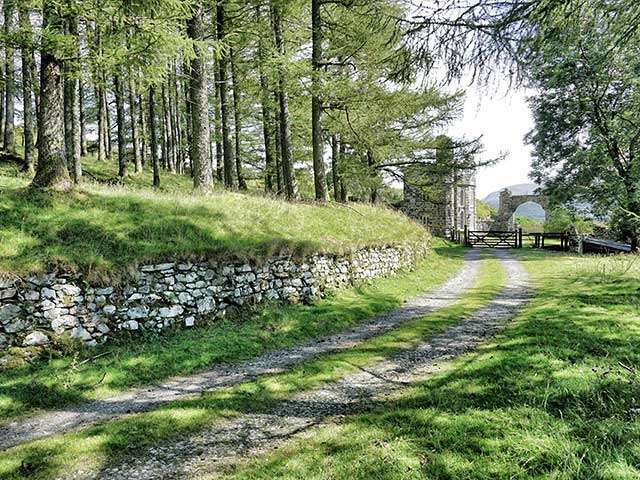 Soon, you will be walking past the western high walls of the deer park and will also have a great view of Foel Offrwm (Hill of Sacrifice) as well as a final glimpse of “Lower Lodge”. Soon, there is a gate in the wall and you will have a view up to the path you have just walked along. Continue along this road, in the Spring you will see (and smell) the wild garlic beside the road. Continue up and soon you will come to a steep part which joins the Llanfachreth Road at “Coed-y-Moch” Lodge which was the start of the driveway to Nannau. Its other name is “Clock Lodge” due to the painted clock face above the arch. The time is fixed at six-minutes to five as the one-mile long carriage drive to the house was supposed to take six-minutes from here, so you would know if you were going to be on time for dinner. Late arrivals were not appreciated by Sir Robert and could end up eating their meal in a side-room. 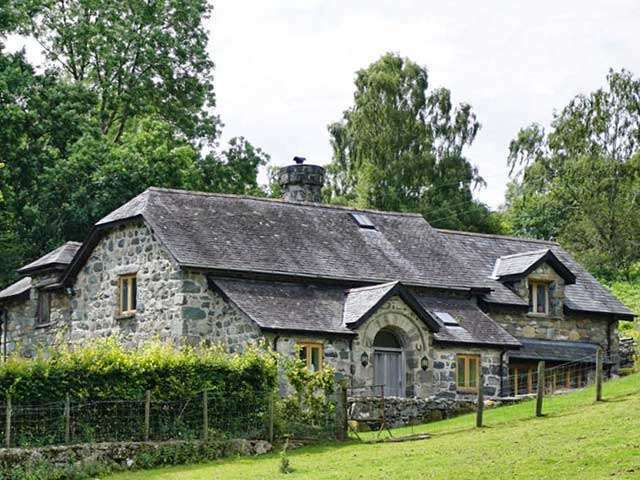 Coed-y-Moch was built in 1830 and translates as ‘Pig Wood’ as it was where pigs were released into the ancient oak woodland to forage for acorns. Look behind and you will see another sign of the Vaughan family with a cast iron gate marked with a ‘V’. 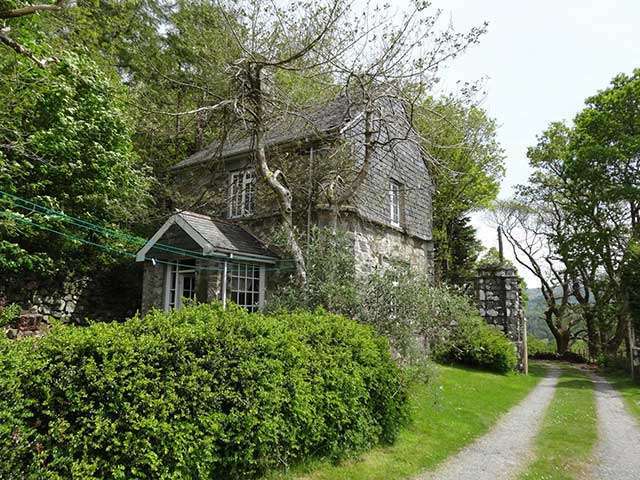 Look past this and you will see the eighteenth-century cottage “Garth Bleuddyn”. The cottage was renovated and a porch added in 1831 with its later date added above the door. The name refers to the Wolves that once roamed the area. Continue up this road, keeping you eye open for cars. After a while, you will see the entrance to “Yr Hen Ardd” (the Old Garden) and some of its high walled garden (and the remains of one of the stone pillars on the hill behind). This was once a walled garden belonging to the estate. This was the location of “Yr Ceubren-yr-Ellyll” (Hollow Tree of the Ghosts) where the body of Hywel Sele was found some forty years after being reportedly murdered by Owain Glyndŵr in 1401. 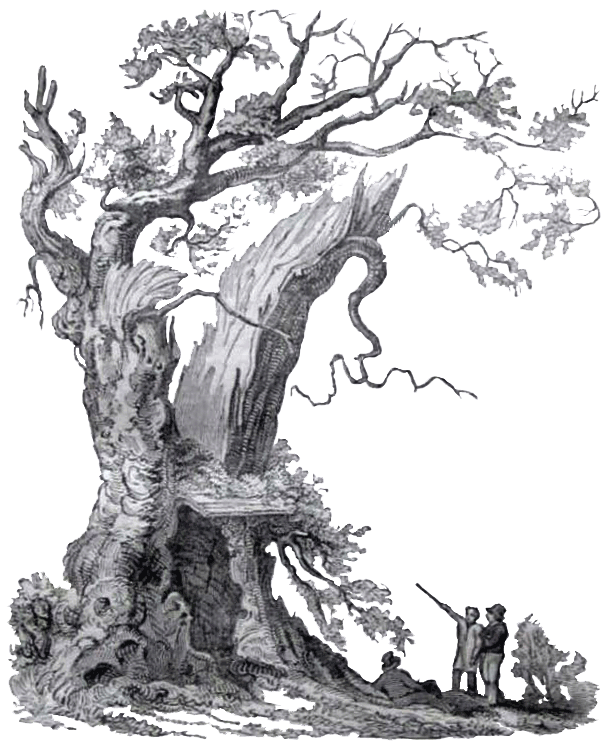 The tree was reported to be twenty-eight feet in circumference and eventually fell four-hundred years later during a storm on 28th July, 1813. It was marked with a sun-dial and now by a post in the private garden. This garden and house seem to date from around 1794, so could have been built around the same time as the current house. In 1818, the garden was divided (with paths) into nine sections with enclosing walls over eleven feet high in places. Just as you pass the private road on the left you will see a lovely 80+-year-old George V postbox set in the dry stone wall on your right. 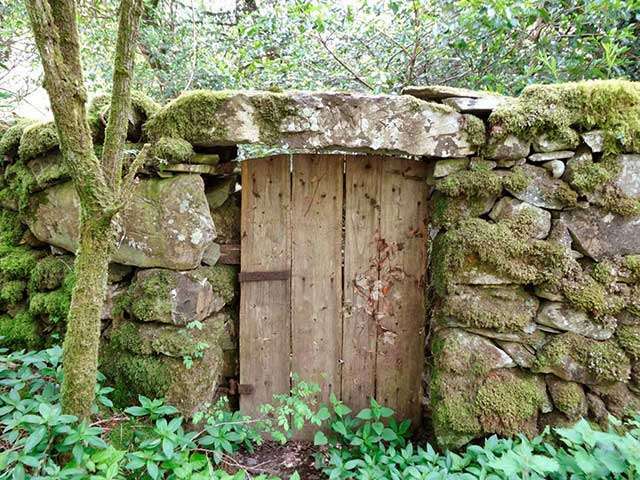 Soon after you will see an old wooden door and engraved lintel “RW V AM 1835,” which was another entrance to the garden and kennels at the rear. Just after this, you will see a sloping field on your right and another view of “Hywel Sele Lodge” at the top. Continue up this road, past the entrance with some more views of Nannau Hall on your left and return to the car park. All photographs and text are copyright © Ian King 2017.